It's probably not a surprise to Technovelgy readers, but in the past year, the number of those who read e-books increased from 16% of all Americans 16 and and older to 23%. In this same period of time, the number of people who read printed books declined - from 72% to 67%. 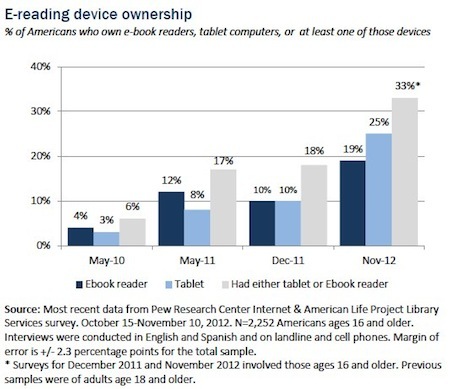 The move toward e-book reading coincides with an increase in ownership of electronic book reading devices. In all, the number of owners of either a tablet computer or e-book reading device such as a Kindle or Nook grew from 18% in late 2011 to 33% in late 2012. As of November 2012, some 25% of Americans ages 16 and older own tablet computers such as iPads or Kindle Fires, up from 10% who owned tablets in late 2011. And in late 2012 19% of Americans ages 16 and older own e-book reading devices such as Kindles and Nooks, compared with 10% who owned such devices at the same time last year. This move toward e-books has also affected libraries. The share of recent library users who have borrowed an e-book from a library has increased from 3% last year to 5% this year. Moreover, awareness of e-book lending by libraries is growing. The share of those in the overall population who are aware that libraries offer e-books has jumped from 24% late last year to 31% now. "The Hitchhiker's Guide to the Galaxy. It's a sort of electronic book. It tells you everything you need to know about anything. That's its job." "I like the cover," he said. "Don't Panic. It's the first helpful or intelligible thing anybody's said to me all day." "I'll show you how it works," said Ford. He snatched it from Arthur who was still holding it as if it was a two-week-dead lark and pulled it out of its cover. "You press this button here you see and the screen lights up giving you the index." Even earlier, sf great Stanislaw Lem described optons (e-books that you read) and lectors (e-books that read themselves to you) in his 1961 novel Return from the Stars.